"Sam no longer felt part of the team and it was really sad to see him crying in the middle of the bench with his gloves off." Ty Clark The Huffington Post B.C. 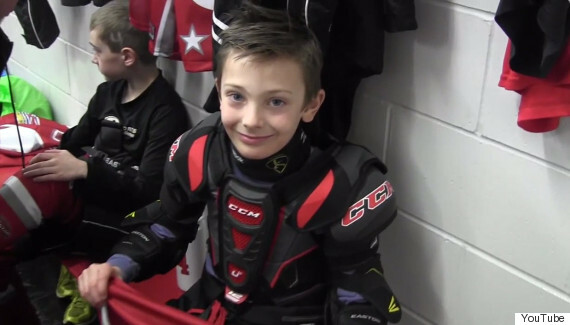 Hockey parents are debating a B.C. dad's decision to withdraw his nine-year-old son from his hockey team after repeatedly watching the boy cry on the bench instead of playing on the ice. Yannick Lescarbeau wrote an open letter to his son’s hockey team, the West Kelowna Knights, outlining his reasons, and making clear he harboured no resentment, reported InfoTel News. He wrote that his son Sam — who "dreams and lives hockey" — was only playing two shifts per game, while the best players were constantly on the ice. "Sam no longer felt part of the team and it was really sad to see him crying in the middle of the bench with his gloves off when he watched the same kids over and over on the ice," Lescarbeau wrote in the letter obtained by InfoTel News. "As a hockey dad, as a coach, to win as a team and lose as a team is a priceless concept that should be cherished and valued more than winning at all cost with only a few (players). This year’s Knights philosophy is clearly not for us. This was not a personality conflict with the coach, but rather a hockey philosophy difference." The letter has raised the issue of what's known as "short-benching." The Hockey Fanatic blog praised Lescarbeau's move, saying that short-benching "promotes a sense of me vs. we.... It impacts the confidence level of the young athlete, taking the fun out of playing a team sport." Infotel News' story was flooded with comments, including one from Lynnell Ible, who said: "Time (on the ice) should be allotted based on effort. Rewarding everyone for showing up creates an environment that rewards mediocrity." However, a parent on a Hockey Share forum noted that if weaker players get less playing time, they'll never have a chance to get better. Since the InfoTel story, Sam Lescarbeau has accepted a spot with the Okanagan All Stars Hockey squad, "so he could finish the spring season on a good note," the team's Kim Dobranski told the outlet. Do you think short-benching is acceptable? Do all kids deserve equal playing time? Comment below.